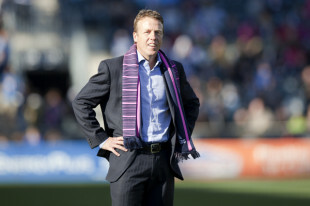 John Hackworth will be the first to admit the 2013 season didn’t end the way he wanted. But he understands the big picture. Ask him whether he should get congratulations on a good season or condolences on Philadelphia Union’s crash out of the playoff picture, and he’s candid. Hackworth directly addressed those obstacles and constraints — and more — during a nearly one-hour telephone interview Saturday with the Philly Soccer Page. Generally, he does not like to discuss those limitations because he thinks it does a disservice to his current team, and he typically avoids publicly criticizing players so as not to add pressure upon them. “Secondly, I don’t like to sound like I’m making excuses,” Hackworth said. But I asked, and Hackworth answered. In the background, I could hear the sounds of the Union youth academy’s U-14 team playing against longtime youth soccer giants Continental FC, previously known as FC Delco. And plans to sign at least one designated player. Philadelphia spent much of the season as a physical, counterattacking team. At home, they often tried to play possession ball, particularly early in the season. The result was a the league’s fifth worst home record. On the road, the Union sat deeper, pressed less, beat teams on the counterattack, and produced one of the league’s five best road records. Over time, the Union veered more often toward that counterattacking style, because it won games. “That’s not the style of play I prefer at all,” Hackworth said, “but as a coach, you have to play to your strengths.” Those strengths were a solid defense and good strikers. Hackworth said his ideal Union squad would play possession-oriented attacking soccer, based on a short passing game in which players keep the ball on the ground. He doesn’t envision a game of constant lateral ping-pong passes, but rather one that uses the fewest amount of passes necessary. “We certainly saw glimpses of that style this year, but we just weren’t good enough to do it game in and game out,” Hackworth said. The formation that team would play depends on the pieces available. “To have a free-flowing attacking style, I like the 4-3-3,” Hackworth said. But he is not the type of coach to determine a system and force his players to play it. For example, he said, Kansas City plays what they bill as a 4-3-3 but often functions as a 4-5-1, and while the team is effective, their style of play can often be “ugly” to watch. In the end, Hackworth said pragmatism will win out over idealism, but he hopes to put the pieces in place to veer his team toward his preferred style. Hackworth didn’t have all the players he needed to do that in 2013, particularly in midfield. The Union could have paid down some of those salaries with allocation money but chose not to, Hackworth confirmed. Instead, the team left those salaries on the cap so they could save allocation money and build enough of a cache to make bigger signings for 2014. That means the team knowingly went into 2013 with a long-term plan, rather than a quick fix Band-Aid, to right the franchise’s course after former manager Peter Nowak and scouting director Diego Gutierrez revamped the roster in 2012 by jettisoning Le Toux, Danny Califf, Faryd Mondragon, and Danny Mwanga and importing several high-priced but underperforming players to replace them. “The goal for us this year was really to be a team that was competitive, to build back some of the trust with our fan base,” Hackworth said. Hackworth’s first order of business is fixing the Union’s midfield. “It’s not a secret that our midfield struggled in that [attacking] capacity, but it wasn’t them alone,” Hackworth said. For example, the Union spent the season with natural right back Ray Gaddis playing on the left. While Gaddis performed well defensively, he rarely attacked down the left like he could down his natural right side. The Union hope to bolster the attack with new player signings. Hackworth traveled to Ecuador last week to scout a player. Meanwhile, top assistant Rob Vartughian was in Europe as of Saturday, having traveled to Denmark, Greece and Germany. Vartughian might also head to Sweden, where the season is over but the Union are interested in a player whose club is playing in one of the European tournaments, Hackworth said. The Union are also actively exploring the trade market. First and foremost, the Union are looking for a center attacking midfielder, a true No. 10 in the mold of Diego Valeri or Federico Higuain. “So if we did find the right guy, we would sign him,” Hackworth said. In 2013, Hackworth tried to shoehorn Michael Farfan and Keon Daniel into the No. 10 role, but he and his coaching staff learned neither fit the role perfectly. In retrospect, both should be “supporting midfielders,” Hackworth said. 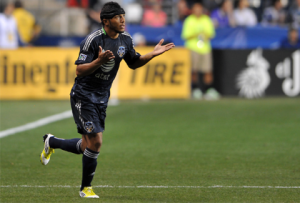 Farfan struggled for much of the season after playing in the MLS All-Star Game just a year earlier, although he closed the season with several strong games. “Michael epitomizes the kind of player I like and I want on a team,” Hackworth said. “We probably put a little too much pressure on him to be a No. 10, to be the playmaker on the team, and I don’t think he played it as well as he could. Hackworth acknowledged Farfan was not a true No. 10, but he’s also not a straight winger who hugs the sideline. “He’s a wide player that likes to come inside, feels comfortable playing in those tight places and coming out of them,” Hackworth said. Daniel is a different story. Hackworth believes Daniel can flourish playing attacking midfield. For him to regain that form, however, Hackworth said Daniel needs to be looking more for shots and passes penetrating into the field’s attacking third, something he seldom did this year. Midfield isn’t the Union’s only need, but it tops the list. The club also needs depth at center back and goalkeeper after skating by this season without a true backup center back or third goalkeeper. “We were really fortunate not to get hit by the injury bug this year,” Hackworth said. The club could pick up a forward as well, Hackworth said, but that is not a priority. Hackworth hopes to sign one or two designated players, but it will not be a player of the renown of David Beckham or Thierry Henry. Rather, the Union would explore the league’s other designated player tiers, such as the young designated player option. More notable may be the new “impact designated player” alternative, which became available this season after Major League Soccer sold a reported 25 percent of its marketing arm, Soccer United Marketing, to Providence Equity Partners for a reported $125-150 million in 2012. “The league would match up to $1 million of the investment [on impact designated players],” Hackworth said. The player must meet certain requirements to qualify as an impact designated player. Notably, the player must be a young attacker. Colorado used this mechanism to sign forward Gabriel Torres this year, as did Toronto with Max Urruti and Portland with Diego Valeri. Hackworth also made clear which players are returning to the club. The Union are picking up contract options for every player who had them, including Conor Casey, Brian Carroll, Amobi Okugo and Jack McInerney. Essentially, all their regulars are under contract, including Fabinho, Mike Lahoud, and Aaron Wheeler. However, Hackworth is exploring the trade market and noted that someone could leave via trade. He once again made clear his preference for acquiring proven MLS players, as he did to good effect last year with Le Toux, Casey and Parke. So everything is subject to change. Okugo and McInerney will get large salary bumps in this option year of their rookie contracts, and the Union hope to sign each to long-term deals. Zach Pfeffer’s loan to Hoffenheim in Germany expires Dec. 31, and Hackworth said he will probably return to the Union next season. There are several players who may not return. Kleberson: His loan deal expires before next season. While the Union and Kleberson are exploring ways to keep him in Philadelphia, his rights remain with Brazilian side Bahia, which likely necessitates a transfer fee, Hackworth said. Kleberson is unlikely to return unless the Union can work out a free transfer with a salary under $150,000. Roger Torres: The young Colombian is out of contract and free to explore moves to other clubs. The Union would explore bringing him back if it’s at a salary lower than his 2013 figure of $121,968, Hackworth said. “Roger is a guy our staff personally liked,” Hackworth said. “He has a lot of talent, and he just has a bit of maturing to do.” He disspelled the notion that playing time incentives in Torres’s contract — which was negotiated while Torres’s former agent, Diego Gutierrez, was working for the Union — kept him on the bench. “It had no bearing whether to play him or not to play him,” Hackworth said. Oka Nikolov: Nikolov could return, but only if at a low enough salary, Hackworth said. He signed a six-month contract for the league minimum in June. Nikolov is considering retirement and could take a job in Germany as an assistant coach, Hackworth said. He expects to know by the end of the calendar year. Greg Jordan: The center midfielder/back will not return to the Union after two years spent mostly on loan in Harrisburg. Several players will be invited to training camp, but it’s unclear whether they will make next season’s roster. Don Anding, Leo Fernandes, Matt Kassel: Each was on a one-year contract, Hackworth said. They will be invited to training camp, but they must earn their contract and roster spot. Like Torres, they are free to explore other options, but the Union currently hold their rights. Yann Ekra: Philadelphia signed the former Harrisburg attacker late this season so they could avoid the discovery process next year and observe him in practice with the team, Hackworth said. They plan to invite him to training camp, where he can earn a new contract. Gilberto: The Union have not yet decided whether to bring Gilberto back, Hackworth said. Lastly, former captain Carlos Valdes is unlikely to return to the Union before the World Cup, if at all, Hackworth said. His loan with Independiente Santa Fe in Colombia expires Dec. 31 and includes an option-to-buy clause. Santa Fe could buy Valdes, the loan could be extended, or another club could acquire his rights. Right now, Valdes looks set to do that, slotting in as a starting center back for Colombia. But he won’t do it while in MLS, which is why Valdes left on loan last winter. “Carlos said, ‘Look coach, [Colombia national team coach] Jose Pekerman said I have to be playing closer to home in Argentina and Colombia,” Hackworth said. The Union do not plan to add a starting center back to replace Valdes because Okugo will remain at center back rather than move back to midfield. “Our plan right now is for Amobi to continue being, in our opinion, one of the top center backs in the league,” Hackworth said. When asked about the debate over whether Okugo should return to midfield, Hackworth said Okugo could play some defensive midfield, but that’s not where he envisions his future. “For me, I think it’s kind of silly that there’s this debate going on,” Hackworth said. “If we get Carlos back, and we have Jeff Parke and Amobi, then you start to think about it.” But not unless that happens. The Union enter the offseason with a decent-sized cache of allocation money, two of the first six picks in January’s amateur draft, a salary budget cleared of dead money, and the prospect of signing a designated player or two. Some may view that as a bit too optimistic, but those are simple facts. They picked up Carroll’s option? Dear God….. He said some good things, then he said that… Maybe he’s trade bait…. I’m not sure why everyone turned on Carroll. As long as people understand what type of player he is there should not be such vitriol. He is an old fashion MLS defensive mid. That is all. People expect him to be more. He is not a box to box midfielder. He doesn’t move the ball. He sits in front of the centerbacks. He is a defender. That job he does very well. Because (i) he is toast as a top-flight player and (ii) he is blocking the best player on the squad from playing his natural position. You did watch all the games this season right? Carroll has lost A LOT this season from last. At 32 he’s on his last legs in the MLS. Too slow for the way this league has progressed and the need for a deep laying anchor man is no longer needed when teams are playing actual football. His job is supposed to be disrupting the flow of the oppositions attack, when in reality he’s only disrupted our own. He’s actually become a liability in the midfield in my opinion. When you’re the deepest laying center mid on the team, you’re main job on the attack is to be able to distribute the ball with simple passes, whether it’s to the wing, an open forward, or backwards. Way too many times does he look for a killer through ball that fails and ends in a counter attack. Carroll has lost a lot.. He was never that great to begin with. It’s just age, can’t fight that. Options are typically only for 1 year longer. That says insurance policy to me. If they can’t find a replacement they’ll use him. Plus they aren’t moving Okugo, so Carroll is the safety net. If they find a good #10 it won’t matter. Carroll will cover for the #10 so he won’t attack and the 10 won’t defend deep. He could stil be traded. Lets see what they do. Fans will shortly know if this team is capable of running a team. Judging by their performance this season the answer is no. I liked everything that was said until the “Amobi will return as a centerback” line. I hope this was a bit of a smoke screen to hide our efforts to acquire another centerback. Honestly I feel better after this article. At least I have a better understanding of what’s going through his head. He’s looking big picture. He was adaptive. And he almost got us to the playoffs. This next year is going to be key. If we make the playoffs he has a future here. I hope they can make moves to get this team to a threatening level. “Secondly, I don’t like to sound like I’m making excuses,” Hackworth said. Every coach makes excuses. He can’t throw his players under the bus. He’s not Sir Alex. No, he’s most certainly not Sir Alex. The in-game management confirms that. It’s rare to see a coach / front office type be this candid about this sort of stuff. Kudos for getting the scoop, Dan! IL your description of BC is exactly why he cannot start again next year. This team can’t afford a midfielder that brings nothing to the table offensively. Did you notice Carroll standing around while Montreal scored the game winning goal? We lost the game that Okugo started at CDM. Will you bash him for not bringing anything to the table offensively? I agree! In my opinion Carroll showed an enormous amount of “laziness” on the pitch this year. Being at center mid, it is critical that the player at that position whether offensive or defensive has to be constantly moving, showing for the ball and creating options. Unfortunately for Carroll, He made too many poor passing decisions, always got knocked off the ball and could not hold the midfield defensively or offensively. He is a nice guy and all but he has been a burden on the team. If Hackworth keeps him for next season that will be his first huge mistake going into 2014. Wonderful article, Dan! This is what makes PSP so special. Definitely confirms a lot of what we’ve all be speculating about. As for Carroll – I wonder if most of us would feel better about him when paired up with a true quality #10. He has the ability to link passes out of the back – part of the problem was that he often had no one opening up space in the center of the pitch to transition. Very promising comments, but until the Union deliver, that’s all they will be…promises. No. I had a lot of questions for him. But what was I going to ask about Danny Cruz that hasn’t already been asked? Cruz never came up. This article was a whole bunch of nothing, really. Just confirming what we all suspected with a bunch of pixiefairyunicorn type stuff thrown in. This isn’t the first time I have heard a bunch of promises coming from the Union and in all honesty I could care less what they are saying and whom is saying it. I prefer my horses named Snoopy and Prickly Pete! Yeah, thought it was funny for him to say that it is a disservice to start Ray as the LB but not to make him ride the bench as the backup RB. I specifically asked if Gaddis or Williams could be traded, and that’s when Hack said that he would like to keep them both. He then went on to talk about the team’s depth. Obviously, it’s possible the Union could get a really good offer, but it’s clear Hack really likes them both. Did I miss of Parke is back? I saw his name come up under talking about MLS talents, but not his contract situation? Parke will be back. All the regulars had contracts picked up, except for the guys I specifically mentioned as being exceptions to that. I appreciate the article. Parkes return wasn’t mentioned but it seems highly unlikely since we got him for allocation money. I say sit tight, March will be here in no time. If you listened to The Philly Soccer Show, Brendan Burke said that they are really happy with the back four. It looks like Parke is staying. Parke is staying (unless he takes an early retirement). We got him for really cheap because he specifically wanted to come back to Philly to raise his kid; I can’t see him wanting to move or the team wanting to move him. This quote makes me think that Parke is here for at least another year. I enjoyed this post. I hope Hackworth and team can get it done. I think if they do half the stuff he talked about cruz is gone. There will be no room for him on the field. Can’t wait till draft day, I want to be there. I am looking forward to next year imagine the park with 2 impact d.p’s and the core of our team. I have absolutely no confidence in Hackworth’s ability to upgrade the talent on this team. If Seattle doesn’t bring back Ziggy then he would welcome change to the limited U/17 mentality of Hackworth. A lot of what Hackworth did frustrated – and confused – me all year along, and I agree he seems to be in over his head, but I will admit he took this team farther than I predicted. I didn’t expect D.C. to be as bad as they were, but I pegged the Union for 8th in the East (SKC, NY, HOU, CHI, DC, MON, CLB) when the season began, so he actually did better than I predicted. I wonder what is/was up with Greg Jordan? He never really gets talked about. Didn’t he play a ton in Harrisburg? I also noticed he was on the disabled list for months. Was he massively injured or something? We talked a bit more about Jordan, but I didn’t include it because the post was running too long. Hackworth said that Jordan did a good job in Harrisburg, but he just couldn’t crack the rotation with the Union and Union management didn’t see it happening next year either. So they thought it better for him to move on. He recognized the midfield deficiencies but did absolutely nothing to change it except rotate the same players. And the worst part is it’s sounds like they’re all back next year. Would anyone honestly be upset if Carroll, Keon and Cruz were all gone next year? Almost anyone would be better. Also, the salary constraints are legit, and a concern. It really makes me wonder more about the FO than Hack. BUT, salary constraints don’t explain mistakes in lineup selection and subs. Couldn’t agree more. If he knew that neither Farfan or Daniel were a fit for that position, then it makes me even angrier that he kept trotting one or the other out there every single match. What’s that line about the definition of insanity? Only in MLS does a team send a starter out on loan. Can somebody explain that situation? If Valdes gets injured on loan, we’re stuck holding the bag. Consider the consequences to overall team morale, to say nothing of the individual’s, if management deliberately denied a player a clearly legitimate opportunity to make a world cup side and play in both qualification and the final tournament. Also, consider the potential financial benefit of having Valdes succeed – as he seems to have – showcasing himself as a top level world class center back. Profitability, not winning, is the bottom line for ownership, any ownership. Not true at all. Jose Reina was loaned out to Napoli this season. Lukaku out on loan after he was thought to start for Chelsea after dominating with Everton. Anyways.. Sending a player on a full season loan and selling him are almost the same thing (minus a transfer fee). It happens all the time. Top players get sold. So why can’t a starter be loaned out, especially at the players request? Valdes wanted to go on loan. Who wants a pissed off player on their team when that team is preventing him from playing in the World Cup? Team Morale is one of the most important things in this sport. Great job Dan. This was probably the most informative piece I’ve read about the team since inception. Quick deduction on the Vartughian scouting trip. The only two possibilities I can see are that he’s scouting the Swedish National Team which is in the World Cup Playoffs with Portugal, or he is scouting Elfsborg which are still in Europa League. I would find it pretty hard to believe that any of the better Swedish National Team players would want to come over to the MLS as most of them are playing in more competitive leagues in Europe. Johannson came over to Seattle a few years back but he was playing in Allsevskan at the time. Plus these players would command much more than I believe we would be willing to pay. The only guy on that squad I could conceive they may be scouting is Pierre Bengtsson (LB) who plays for Copenhagen. Most of the better Elfsborg players are older (Ishikazi, Nilsson) and are team lifers (plus don’t meet our needs), so again I’d find it hard to believe they would be the targets, I’m again thinking if it is Elfsborg they may be targeting Left-back . . . possibly Stefan Larsson older but not as entrenched in Elfsborg. He was referring to a club team, though he didn’t name the team. We’re pretty sure it’s Elfsborg. I should have been clearer on that above. Also, thanks for the props, to you and everyone who said so. It’s nice to hear. Glad this was of use. Outstanding article Dan. Well done. I saw that Bahia cut ties with Freddy Adu. I thought he had a guaranteed 2 year deal. I thought the Kleberson deal came down to trading a guaranteed 2 year contract (Adu) for a 1 year contract (Kleberson)?!?! Is Bahia eating a year of Adu’s salary? What’s up with that Dan? His assessment of Keon Daniel is baffling. If Keon Daniel starts next year, we will miss the playoffs yet again. Daniel will never flourish as an attacking mid. How many pundits from Kyle Martino to Julie Foudey called him out this year for not doing enough. It is even more troublesome that Hackworth continues to eye him in a significant role here. He will continue to shoehorn him in. Now the only issue is we don’t have any depth behind him to complain about on a weekly basis (no Kleberson or Torres). Does Chsristian Hernadez even stand a chance of leading the attack? Daniel is one of the key reasons we are not buying season tickets next year. The other reason we are not buying in and supporting this team with money, is they have promised to build this team and nothing has come about every year. That one is on Nick Sak-of-shits. Plus, I don’t feel Hackworth is up to the task. He really made boneheaded moves in games, he rates Daniel (and Cruz and Carroll for the matter) and has the same formulaic subs in every game. What makes you think this simpleton can build a team? Ugh. Get a new coach already. Hack pretty clearly said he wants to get a No. 10 who isn’t Daniel. The words “can still flourish playing attacking midfield” were mine. Basically, Hack made it pretty clear that Daniel didn’t have a good season. When I asked him where he thought Daniel should play, that’s when he mentioned seeing him play attacking mid in Trinidad, etc., etc. I didn’t come back for more specifics on where he should play because the implication was that he can play there, but Hack made clear he has to actually pick his head up and push into the attack. Hack also called him a “supporting midfielder.” If he wants a new No. 10 and someone new to lock down the left side of the midfield, how many positions in MF does that leave open? CDM and RM. Keon isn’t playing either, unless the Union play a 3-man midfield triangle or go with a straight 4-2-3-1, in which case maybe he’s the second CM in that central triangle. Bottom line, it’s pretty clear Hack doesn’t want Daniel leading the atack next year, but he also isn’t dismissing him as a garbage player. Have you ever seen him play for T&T? I’m assuming not. Hackworth is not making this up. Even last year I believe Keon had a hatrick and 2 assists in one game. What’s more baffling is why he’s not doing it for Philly. I suspect it has something to do with those around him as much as he is to blame. It is a bit frustrating to see Keon play so well with T&T and to not have that same performance with the Union. If you study Keon closely you can tell that he has great touch on the ball and is one of the smartest players on the team. I really feel that the Union’s pace was very slow this year and that could have something to do with Keon’s underperformance. Obviously Keon can improve on a lot of aspects of his game like his defensive play, his aggressiveness and speed but improvements can be made for every player on this team. I think Keon can thrive on this team if they start playing an up-tempo style of footy. I believe the true disaster in the midfield this season was Carroll’s poor play game in and game out. I should add here, because it came up elsewhere, that it was my assessment that the only way Kleberson would return to the Union is on a free transfer at a $150k salary or lower. Hack wouldn’t publicly detail the specifics on what it would take to bring Kleberson, but when I ran my assessment by him, he confirmed that I was about on the mark. Great recap and I will reference this superb article in my end of season analysis on Philadelphia! Reading this after listening to the podcast has really helped me to grasp what was going on behind the scenes. While I still don’t understand where Cruz will fit in, I am glad to hear that there was some thought in to what we saw on the pitch. Thanks Dan! You asked a lot of the questions we all wanted to ask ourselves. Too many questions not asked (or cut from the article for brevity’s sake). I would have loved to see something about his baffling use (or lack thereof) of Kleberson. $500k sitting on the bench all season long when he knew neither of the other ACM were working out. And when he finally does get some action at the end of the season he produced the most memorable goal in the Union’s short existence. I wondered throughout the year why Kleberson didn’t start more often too, so a few things to note. The Union won only 1 of the 7 games he started this season. He hasn’t played a 90-minute shift since about 2010. And he historically was not an attacking mid. I also don’t think that’s the most memorable goal in Union history, though it’s obviously one of them. I’ve been a big supporter of your writing, but I’m gonna disagree with you here. Please stop giving us these stats of how kleberson shouldn’t or couldn’t do 90 minutes, too soft, didn’t fit in MLS etc. Your better than that. Also if you didn’t think that was the best Union goal ever you need to re-read your previous article about that game. I’ve been to 95% of home games since the inception and NOTHING was like that goal and the joy it brought to us in the stands. I was playing devil’s advocate. Like I said, I’ve wondered why he didn’t start more often, but I guess I should make clear that, if you didn’t see my previous columns, I wondered it out loud in my writing on PSP and said he should have started and played more. as well? This may be a issue with myy web browser because I’ve had this happen previously.